Prof: Someone more eloquent than I suggested that the prolific lettercol writers of the 60's made the Schwartz columns more fun than the comics themselves. What made you decide to participate? Irene Vartanoff: It was a challenge. I'd been writing all my comments on postcards, mostly to the Superman line. To write something longer required a different kind of approach, more critical than fannish. The intellectual exercise of composing a coherent letter of criticism appealed. I had written letters of comment to other publications in the past and they had been published. In the Washington Star newspaper, for instance. I knew I could succeed at this, but writing the in-depth criticism Julie obviously preferred was different from writing the congratulatory notes Mort Weisinger and the other editors liked. I made a conscious effort to write the kind of letter Julie printed. The opinions were all my own. Prof: I never knew any girls cool enough to read superhero comics back in the day. Did you feel you were in a minority? IV: I first read comics at a girlfriend's house when I was ten or eleven, so no, I didn't. I only realized girls were a minority of comic book fans once I noticed that all the fans who wrote serious letters to the letter columns were boys. The Superman letter column pages were not highbrow intellectual circles. But Julie's letter columns were a cut above, and mostly letters from boys. As far as comics-reading itself, I grew up in a very highbrow milieu, one in which parents did not bring trashy comic books into the house, only quality hardcover children's books. My mother endlessly took us to cultural events; I have the distinction of having seen the opera "Don Giovanni" performed by puppets, for instance. I hate puppets. Parents also expected high achievement from their children. The intelligent kids put away childish things at puberty, and ironically, that's when I became a comic book fan. My parents objected strongly to me bringing them into the house as a teenager. I'll probably blog about that battle some day. My high school friends read serious modern literature like Salinger, but I was reading Tarzan, Doc Savage, historical novels, murder mysteries, romance novels, Gothics, and science fiction. I knew nobody who read comics until I became acquainted with other comics fans through the letter columns. And it was not until many years later than I met anyone who read romance novels. Not even in college. 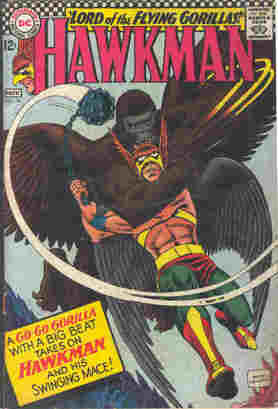 Prof: When you wrote The Letter, published in Hawkman #18, were you surprised it saw print? IV: Very surprised. And proud. I had not written it expecting it to get published. I'd simply been moved to write it. My father had me read him the letter, and he praised it, saying it was well written. This was a peak moment in my life. He died only a few years later, so I was very glad that he and I had that. (I'm posting about it on my Wordpress blog, on the anniversary of his death.) I guess because of the connection with my father, all other considerations about the letter have faded in my memory. Did I expect to be famous from then on? Perhaps. Was I? Kind of. Comic book fans from the Silver Age still contact me to talk about my letters. I received a very moving tribute just recently from one fan whose mother finally allowed him to read comics because he showed her one of my letters with my college address attached. But although I treasure every one of those contacts, I have come to realize that what made my letters special was that they epitomized feelings that other comic book fans had, but did not have the ability, or the time, or the whatever to express. So I was speaking for my generation. As proud as I am of my personal accomplishment in writing those letters, I recognize that being a representative of many other fans played a key part in it. Now for the story. I really must say that "Lord of the Flying Gorillas" should never have been written. It was just plain awful! Lost civilization…evil, power-mad high priest…good queen in danger of losing throne…hero to the rescue…where have we heard that one before? More to the point, where haven't we heard it before? You may contend that Gardner Fox gave the old story a new twist when he inserted the scenes in Illoral, but that is untrue. The weary old story turned up even more battered and boring when Hawkman "gambled that these moth-men would have the same characteristic traits as the moths on Earth." We've heard that one before also, and who wants to hear it again? Even if Hawkman has to go back to fighting "ordinary" criminals, it would be a vast improvement over these science-fiction rehashes. Also, we could do without those typical Gardner Fox re-doings of ancient Earth myths and legends. Moses as an Illoralan, leading his winged people from the enslavement of the moth-men to the promised land, is not only a bit sickening, but totally unnecessary to the story. It should have, at least, been more subtle. To dress the Illoralan leader in full Biblical regalia, beard and all, is not what I call clever, even if it did give a big hint to the eight-year olds. Lastly, when Gardner Fox portrays the emotion, love, he should "shut up"! To quote—"She whirls—hurls herself into the strong arms that mean her happiness! She clings quivering, helplessly…"—terrible! It is false; it is cloying; it is unnecessary. Mr. Fox doesn't have to say "Hawkman loves Hawkgirl"—we know that! A little less silly verbiage would be in better taste all around. When I first became enamoured of Hawkman, it was for a strange little scene in one of the tryout issues. Hawkman and Hawkgirl sat in a darkened room and probed their memories for an important answer to a puzzle. They sat (as I recall) for hours until suddenly the clue was found. And it struck me then with full force that Katar and Shayera Hol were "different". They were not the run-of-the-mill Earthmen with an assumed power, who took the pledge to fight evil…they were members of another race, inhabitants of another planet, products of a totally different culture. There were certain similarities, of course, but basically, the fact remained that Hawkman and Hawkgirl are not, and never were, committed to Earth. They are here to learn our crime-fighting techniques; that is all. And, it can also be said, they are here to learn about the ordinary happenings of this works, the petty crooks, the arch-crooks, the prisons, the courtrooms, the police stations. So they have "secret identities" of normal Earth-people, and they fit into our patterns of life. Fine. One could wish a little less stolidity, but generally, things are looking up. Then, issue after issue, their adventures have less and less to do with life at the museum, or life in the city…soon they are concerned totally with monsters on Earth, monsters on other planets in different dimensions, on space-wars, on (ugh!) lost civilizations, and mystic secrets, and super-super-evil organizations. 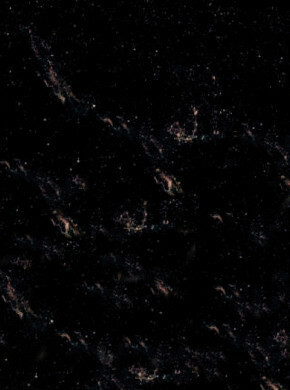 This is Earth? This is the study of Earth-methods of crime-fighting? Hawkman and Hawkgirl are fully competent to fight and conquer super-menaces…their civilization brought them up to an acceptance of what Earth people consider fantastic…but what are they doing fighting them? They are here for another reason. Or have they completed their mission? Have the Hawks learned all we can teach them? Is it, in fact, time for them to be moving on? And where do they go from here? There are two alternatives…one, return to Thanagar and battle crime there…or, two, go on to another planet and study its anti-crime methods. Either course gives them plenty of leeway for pure science-fiction, which seems to be the main factor in their popularity. Anyway, it is obvious that Hawkman needs (desperately) a change. He must either be firmly rooted in Earth-reality, or be completely transplanted to a more naturally and believably exotic locale. Otherwise, I am afraid that his adventures will continue to be divided in purpose and disastrous in result." Prof: Your name came up in a couple of books like that Metal Men (what issue number is that, anyway?) 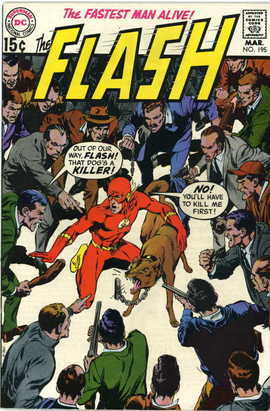 on your blog and the splash page of Flash #195. Where else? IV: It was Metal Men #21. A fun story. I liked the surreal quality of Robert Kanigher's Metal Men. I might have been in the background in the Avengers story [#83] that took place at the Rutland, Vermont, Halloween superhero parade that the late, great Tom Fagan organized for years. I was part of the parade several times. A batch of us from New York drove up to Rutland and garbed ourselves as comic book characters and climbed on floats that paraded around this small town in Vermont. I usually dressed as a witch, because that kind of costume covered me—it was cold! The first year, when I was Tala, a witch character, I made the mistake of attaching fake long fingernails with glue. Ouch. The memory of that icy glue is with me still. Another year I was some other witch called Karnilla. I also went as Heimdall's sister. At least, according to my own sister, Ellen Vartanoff, who was there in costume as the Enchantress. Anyway, I was a Viking, and the blond wig and fake fur I used for the costume were very effective in keeping me warm. Was I in the comic book about the parade? Maybe. It hardly mattered, since I was in the parade itself. Other mentions: Gerry Conway used my first name and Michele Wolfman's in passing as lovelorn gals in some story or other. I forget which. Probably a weird mystery tale. I think there was a DC Comics version of the Rutland story, but memory is vague on this, and I doubt that I was in it. Although I was part of a large amorphous gang of young people hanging around comics in the early 1970s, I was more an observer than a star. Prof: Did you ever imagine that one day you'd end up writing comics? IV: Of course. I sent Mort Weisinger a complete Lois Lane story while still in high school. He didn't buy it. This was in 1965. Mort had already invited me up to New York to get a VIP tour of the office and have lunch. My mother and I took the train up. She went to various museums, and I was treated like royalty at National Periodical Publications, including a fancy lunch out. Mort Weisinger introduced me to everyone and treated me in a fatherly way. At the end of the day, the editors gave me a huge armload of original artwork. It was probably the best day of my life to that point. Adult life has surpassed it, but what a moment! Prof: Did you ever participate in one of the DC office tours? When did you finally get to meet Julie? Was he a mentor for you? Any stories you'd like to share about him, other than his legendary love of bean soup? IV: I must have met Julie Schwartz during the tour Mort Weisinger gave me. And I sometimes received written replies to my letters from editors, including from Julie. I met everyone. I also took other tours, and went to conventions and spoke to or saw about everybody active in the business. Julie was never a mentor, although by publishing my letters and saying nice things about them, he did encourage me substantially, as had Mort Weisinger. But when I came looking for a job after college, Julie told me to go home and get married. That was a blow from which it took me years to recover. You can read the stories of other fans going up to the DC offices looking for work and getting offers. I got the advice to go home. Mort Weisinger was gone by then. I wonder if he would have given me the same advice? I didn't go home, of course. But still. Julie never asked me to write anything for him except more letters. Which I didn't do. I was on the path to adulthood and my letter column days were over. I also did not want to hear his sexist advice, even though it may have been kindly meant and the same thing he told his own children. The big shock to me was that Julie's words represented a complete about-face from the encouragement he'd given me all along as a letter writer. It suggested that what he had done in the comics was a lie, something he did not believe in. In the comics he edited, he actively encouraged women as professionals and major actors in his stories (think Jean Loring, for instance), and yet in real life he apparently didn't. That was my take on it. I was a brave young woman to come to New York from my sheltered suburb and sheltered college hundreds of miles away. The path I wanted to tread was not more of being a child or of fitting in with the old patterns of adult female subservience and nonentity in the workplace. I was pretty insecure and emotional about it, though, and far too much of a perfectionist. Comics meant so much to me. It was a recipe for disaster. I was teetering on a precipice, and the two men I had trusted the most had abandoned me, one (Mort) by being gone and the other (Julie) by telling me to go home and get married and, by implication, give up any dreams I had of achieving anything as a person. Prof: What was your first published script? How many stories did you write for DC? Did you have a favorite editor? How long did you work in the industry? What made you decide to script for Marvel? Did you have a preference between full script and Marvel method writing? IV: [But] Julie wasn't the only game in town. I wrote a weird mystery story for Joe Orlando, a Lois Lane story for Nelson Bridwell, and several romance stories for Dorothy Woolfolk. All at the same time. Plus others that were supposedly romance/Gothic suspense stories. But I did not find a mentor in any of those fine editors, and when I needed writing help, I did not know where to turn or even how to ask. Youth and arrogance and insecurity. 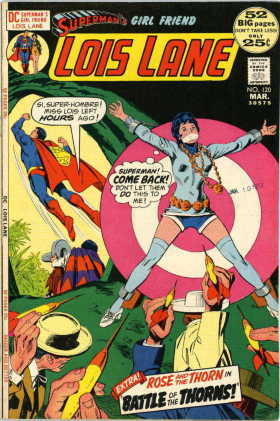 The only one of the half-dozen stories I wrote for DC Comics that I know was published intact was "The Price is Right." It appeared in Young Romance #182, cover date May, 1972. Guy Lillian told me that when he worked for DC as an editorial assistant, he was tasked with writing off some unusable stories and mine were among them. He was probably right about their quality. That period of writing comics sent me into writers' block. I was a perfectionist, and I got hung up on a rewriting issue that since then I have helped other writers through. Unfortunately, my college writing courses and textbooks were of no use. Despite having friends from fandom who were themselves working as comic book writers, I was too foolish and proud to ask them how to solve my artistic problem. Instead, I shut down into writers' block. Pause to shake head at youthful folly. After a gap of many years, when I was story editor for MyRomanceStory.com, which publishes Internet graphic romance novellas, I got the important writing training I never had previously. And by then I had a much thicker skin. I had analyzed romance novel manuscripts for decades, and helped other writers overcome their problems. I knew how to fix stuff. Now I was working directly with plot proposals and rewriting romance comic book stories, or nudging writers to do so. I found that I still knew exactly what I was doing about dialogue and pacing. And with the strong input of managing editor Tom King, I got a handle on plotting at last. This was a pivotal experience. I rewrote so many stories by other people that I finally pushed through my 35-years-long writers' block and wrote my own stories. When the company stopped buying new material, I started writing novels. And this time around, I finished them. Prof: You made an interesting observation in one of your writings about how you and the other "new blood" were kind of resented by the earlier generation. Care to elaborate? IV: I think I covered that well in Jacque Nodell's blog, and in the MyRomanceStory.com blog, which I write as Poison Ivy. Prof: Which writers did you admire at the time? 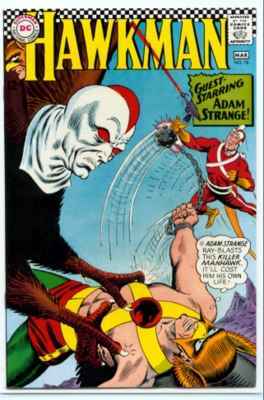 IV: I was quite the Gardner Fox fan, searching out all his paperback originals and loving Warrior of Llarn in particular. I loved all the science Julie's writers put in the comics. Lasers and Quasars and such. I was even inspired by comic books to read the Scientific American article detailing how lasers worked. Something I would never have done without comics. Prof: Which artists did you particularly enjoy? IV: I absolutely adore Kurt Schaffenberger's work. Jim Mooney was a favorite. I read so many stories by Curt Swan that to me his is the definitive Superman. Ramona Fradon's work on Metamorpho was glamorous. I love Murphy Anderson and Sid Greene when they do both pencils and inks. Bruno Premiani's Doom Patrol was exciting. Many others called to me, each in their own way. But the truth is, art without content is nothing. That's why Kurt Schaffenberger's Lois Lane stories speak to me more than anyone else's. That's why a certain run of the FF was so fine, and various issues of Spider-Man, and why Agent of SHIELD was so utterly marvelous at a specific time when Jim Steranko was drawing it. The melding of story and art in comics can be wonderful. It's the mix of talents that produces the best work. Prof: Who did you like to draw your stories? IV: In an ideal world, Leonard Starr would do every story I wrote. He draws attractive, glamorous people, but they look real, too. And he can draw action but also is sensitive to fashion and makes the effort to differentiate how people look. No stock blondes in red dresses for him. Kurt Schaffenberger of course is no longer available, but Ramona Fradon and Jim Mooney would be high on my list too, for the same reasons. And if Marie Severin weren't fully retired, I'd be begging her to draw anything she liked, and racking my brains to write funny copy for whatever she came up with. She's the best ever for humor. Prof: You've been writing for decades now. Is it still enjoyable? IV: If I didn't love writing I wouldn't be doing three blogs, plus novels, plus interviews and letters and whatnot. If anything, writing is more enjoyable for me now, because when I have an idea I can consider a multitude of formats and venues for it. And you're right, although I have not been continuously published for decades, I have been writing the whole time. Eventually, I hope to get every story idea I ever had into print. Or "print" as it will in the future be construed. Prof: As a writer, do you feel it's something you must do? IV: Writing is communicating, something that is necessary for humans. Even the religious hermits of yore were in a long-term conversation with god through their prayers. Talking is communicating, too; Dorothy Parker certainly said more funny things than were ever written down. If it wasn't an even more difficult profession than writing, I might have been a stand-up comedian. That requires similar skills to writing: pacing, timing, word choice, delivery, etc. And an audience. We write to be heard. Prof: Any tips for the aspiring writer? IV: The most important thing aspiring writers should do is value themselves. Writers can get taken advantage of very easily. They should never sign away their rights or give away their work. Life is long; living to see your creations making other people a fortune can make life feel even longer. Once I understood what had been done to the majority of comic book creators, I had great pity for them. Still do. It does the world no good to see the corporate owners of DC Comics or Marvel Comics get rich on the ideas of disenfranchised creators. Prof: Your entry into the industry can likely never be duplicated again. Any feelings on that? IV: That's true of my whole generation of comic book fans who became pros. We came in as a baby boomer cohort—the military term is apt here—and we swept the business, changing everything. That was then, and now things are different all over again; Paul Levitz' "retirement" makes that clear. Our time came and went, and the lesson is that every person or group's time comes and goes. The how isn't that important. Everything has a life cycle. When we are young, we don't see the cycle yet, which is probably just as well because our job then is to forge ahead. It's nice that a particular era can be invested with glamour—the Silver Age, for instance—but it was only a moment in the long timeline of our individual lives. We can't stay eighteen forever. Prof: What is your fondest memory of your time as a comic book writer? IV: When I was young and it was summer and I was sitting on a blanket in Central Park writing dialogue for a comic book story and getting it right. And absolutely knowing I had. For a writer, that's the most wonderful feeling. You got what was inside outside. You did it. Much later, a different kind of pleasure writing Internet romance novellas and finally completing a story I'd started as a novel a decade before. And seeing it in print. A rush, I admit it. I hope to have many such in the future. Prof: What made you decide to move on? IV: Since I had pretty much closed myself off from the creative aspects of comics while working in the business, it eventually became just a job. I had progressed to a logical stepping-off point, where I had developed great employee skills but wanted to be connected to the work in a more heartfelt manner again. So I left comics because I was drawn to romance novel publishing as it developed into something cutting edge, in line with my interests as an adult. It allowed me to use my analytical abilities. Later, I loved doing romance comics for MyRomanceStory.com, fusing my different knowledge and skill sets. I would write more comics in a minute, but I am only interested in telling stories from a woman's point of view. The comic books published by Americans today are very male-centric. So I imagine I'll stick to writing novels from now on. Prof: Why did the romance comic die? IV: I've covered this on Jacque Nodell's excellent blog and I don't have much more to say about it. Why didn't you buy those comics? That's your answer right there: They didn't interest you. You and the rest of the world. Prof: Recently Archie has been drawn in a more realistic style that seems to hearken back to the romance comic. Do you think it could work today? IV: I've never liked Archie Comics. I think they are a tired and empty form of entertainment, boring sitcoms on an endless loop. When I worked for a distributor, I noticed that only young children read them. If you're asking if I think romance comics could work today, my answer is that adult American women believe comics are for kids. And adult women are the largest bump of the romance market. (I've written about the limitations of manga on the blog at MyRoamnceStotry.com.) American comics with an American sensibility might be something the generation of young women raised reading manga as girls would like. But these romance comics would still have to be from a female point of view. I was just looking at the Spider-Man newspaper strip, and MJ is taking off her sweater and revealing her bra. Women do not like this. Aside from the inappropriateness of this sleazy display in a family newspaper, there's the reality that we women want to see pictures of us in cool outfits and beautiful gowns or toting Uzis and showing tramp stamps, not casually exposed in our underwear. Until a publisher comes along who gets this, you will not have true American romance comics. Prof: Is there anything you didn't get a chance to do at National or Marvel for that matter that you wish you could have? IV: I had my chances and I did not take full advantage of all of them, although I did learn plenty on staff and performed a wide range of tasks, including doing lots of freelance coloring. And don't get me wrong. 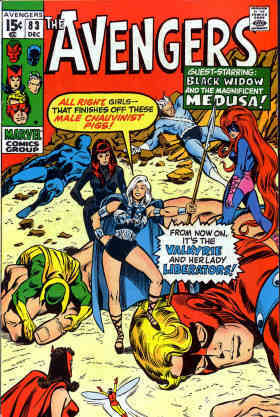 Even though Marvel was consistently sexist in rejecting story ideas from women, I was offered opportunities to write comics. And Jenette Kahn would have handed me Wonder Woman. She offered. After my initial comic book writing efforts did not meet my own super high standards of perfection, I declined all offers. And that made my position in the field not much better than that of any young woman trying to make her way in a male-dominated business full of rampant egos in which the creators were the stars. I wish I had not had writers' block for 35 years, but at least I don't anymore. Prof: You do some blogging on finance and practical matters. Is it an enjoyable endeavor? IV: I love it. I am very interested in personal finance and in the whole area of decluttering, which is related to financial issues. I'm constantly trying to keep on the right side of the vast, ever-changing financial edifice that rules our lives, and urging others to do the same. I volunteer as an income tax preparer each year. If I had been raised by people interested in finance, I might have become an accountant and enjoyed it. (Pause to let you shudder.) As it was, I was raised by people interested in literature and history, and here I am, writing stories about ghosts haunting the opera and young women who discover they have superpowers and must save the world. Or multiple worlds. IV: I'm writing novels now. Women's fiction, superheroine adventure, paranormal, romance, whatever. Collecting rejections, which so far have been rather encouraging. I'm writing fast, to make up for lost time. It's fun again, and that is what matters most to me.